Behind the scenes, I’m preparing to share with you a shoot I had the pleasure of working on with Paper Antler, Shauna Younge Dessert Tables, and Design8Days, but in the meantime I’d like to turn you onto a certain clutch from Ila Handbags, a brand Flutter Boutique introduced me to and was featured in our shoot. 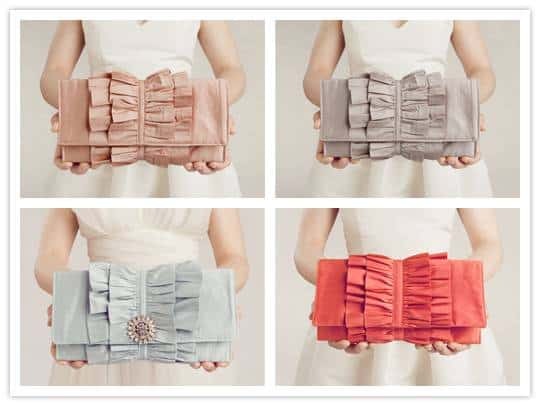 Perfectly pleated and often accented with a brooch, the Frenchie is easily one of my favorite bridal bags I’ve found to date. I love the long envelope format as a rule, but the ruffled design is the icing on the cake. With a number of stunning color choices, they’re definitely a piece to consider for any bride or bridesmaid. Can’t wait to see more from the shoot! Those are gorgeous! They’re certainly marvelous for a formal occasion like a wedding, but they’re so delicious I want to carry one around all the time!